The above is a page which I have made up to show within my powerpoint presentation which gives you some idea of the small differences I encounter between Eurasian and Greenland/Icelantic Wheatear. It is so difficult in the field although certain pointers give you a good basis to work - especially the grouping and the time of year which is my number one and then we will check out the rest! hope this helps. Stonechat still sat on the wall, watching out whilst his Missis is so busy! his colourful plumage is a sight for sore eyes - so stunning! Nearly forgot! First Blackcap arrived back and singing in the bottom of Dalton Crags (still a little subdued) but should be going for it from tomorrow on. 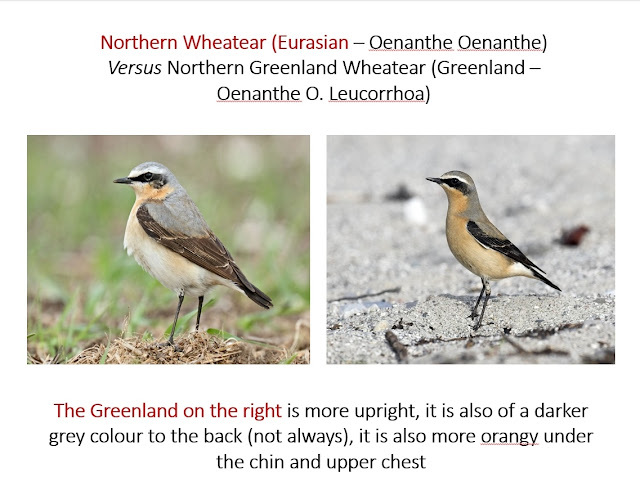 Anyday now I would expect Greenlands/Icelandic/Faroe Island Wheatears (O.O. Leucorrhoa) to start to be seen on Hutton Roof and other localities. I remember from two years ago today (16th April 2017) we had a party of no less than 16 birds on Wheatear Plain in Dalton (deforested/upper). I can remember them usually coming in with trips of Dotterel when I lived down in East Lancashire, and today (16th April 2017) the Dotterel have been seen and photographed down in Bedfordshire. Also Hoppy down in Wolverhampton rung a Wheatear this morning which was of the "leucorrhoa race" with wing at 108mm.